This revised, step-by-step guide discusses the importance of a home care routine in plain language. Its detailed brushing and flossing photos eliminate guesswork. Text explains the cause of decay and gum disease, motivating patients to stick with it. Points out that it is easier and less expensive to prevent disease and decay than to treat them. 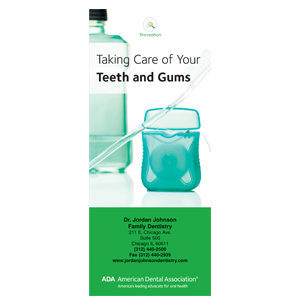 Also includes tips to help patients choose dental products. 8-panel brochure. Minimum order 150. Click Add to Cart then personalize for free. Now you can add personalized information on the front, back, or both covers on all brochures.